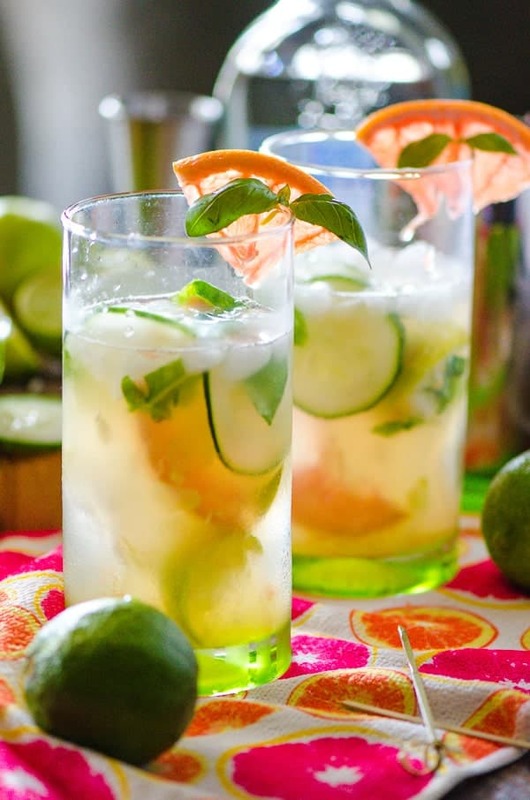 Citrusy, earthy, and not too sweet, this refreshing spring cocktail is perfect for lounging and enjoying the weather no matter where you live! Is there anything like a cool drink on a warm spring afternoon? Relaxing by the pool or in the backyard, nothing ushers in the season quite like good conversation, lots of sun, and a frosty, refreshing cocktail in your hand. 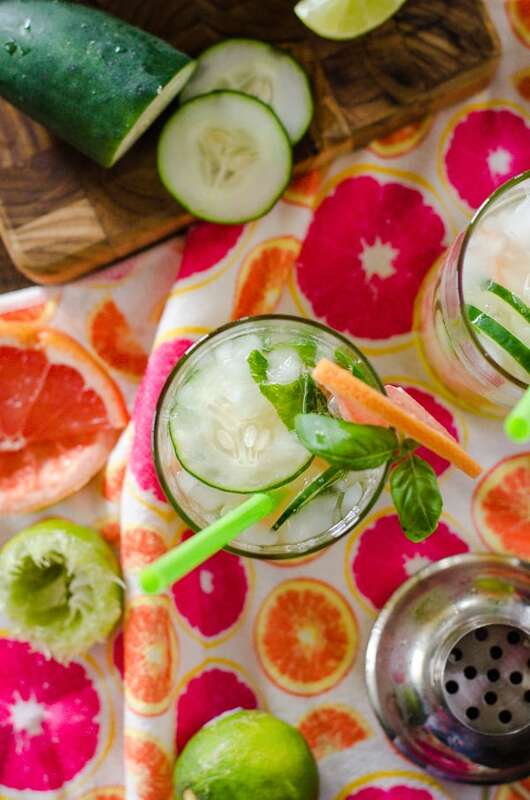 If you’re a citrus fan and your beverage of choice is one of these Cucumber Grapefruit Basil Mojitos, I promise you’ll be mixing up extra batches! Spring sprang a while ago here in Florida, but Mr. Crumby and I celebrated it yesterday at Walt Disney World during Spring Dapper Day! An unofficial event, it’s a day to celebrate the tradition of stepping out in style, often bringing out ladies and gents dressed in their best from back in the day. This was my second Dapper Day, and getting my hubs to dress up with me and enjoy the off-and-on weather was an absolutely wonderful way to spend a Saturday in April. That happened after we got home from the park. The fickle rain clouds disappeared and the sun finally broke through and stayed out until it set, giving me a little sunburn as we sat in the backyard, enjoying a couple of these, playing with the pooch, and doing not much else but watching the wind blow through the trees. It was a perfect evening, wrapping up a lovely day with lovely people. This is definitely going to become my new go-to entertaining cocktail! 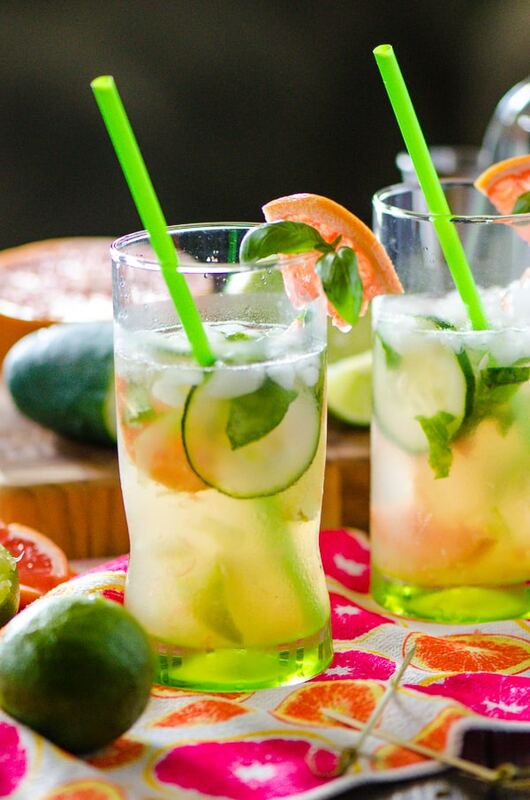 The citrus combined with the muddled cucumber is so super refreshing, and since I’m not a big fan of mint, the basil variety was much more pleasant. I highly advise using lemon-lime soda instead of plain club soda, since it adds another layer of nice sweetness. 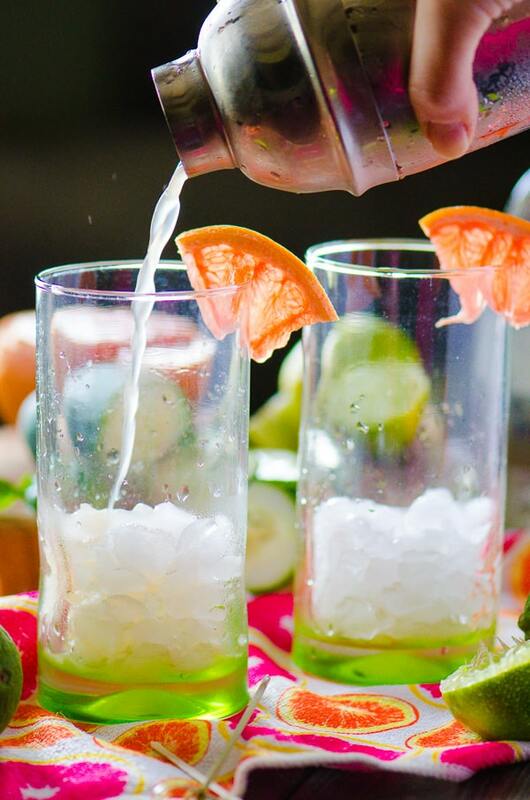 And then rum…because it’s just not a mojito without it! Add cucumber and basil to a cocktail shaker; muddle gently with a cocktail muddler, pestle, or the back of a spoon. Add lime and grapefruit wedges and sugar, muddling them gently as well to release juices. 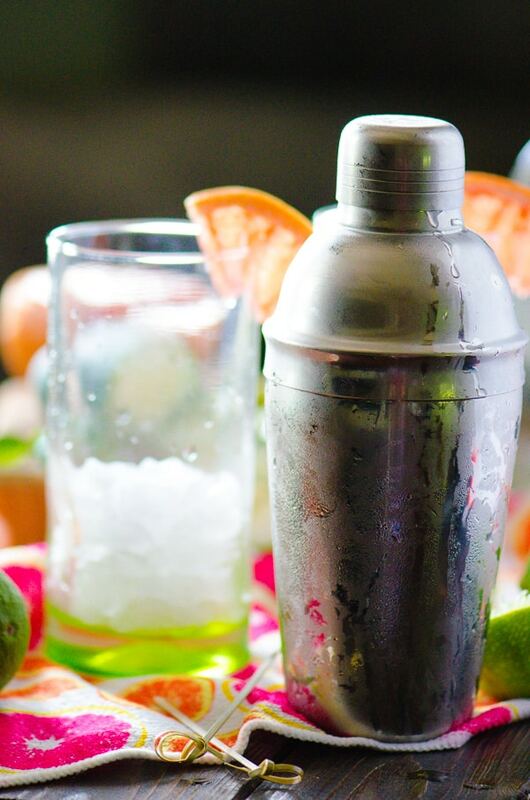 Add lime and grapefruit juices to shaker. Fill to top with crushed ice, cover, and shake vigorously for 20-30 seconds. Pop in a straw, kick back, and enjoy! Wanna further welcome spring? Check out this impressive list of fresh recipes from #SundaySupper! Now this is going on my Summer menu for dining on the deck! So refreshing! 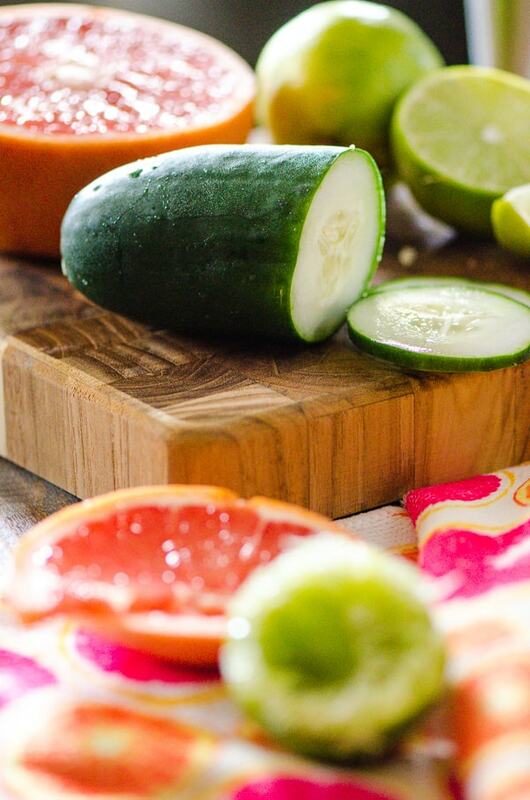 It’s a good thing citrus is available all year long! I can see these on my table come December, too! I’m not much of a grapefruit fan, but this drink might win me over! You know, I’m really picky about where I consume grapefruit, but it’s just present enough in this to make it pleasant and not overwhelming – the flavor combo is lovely! 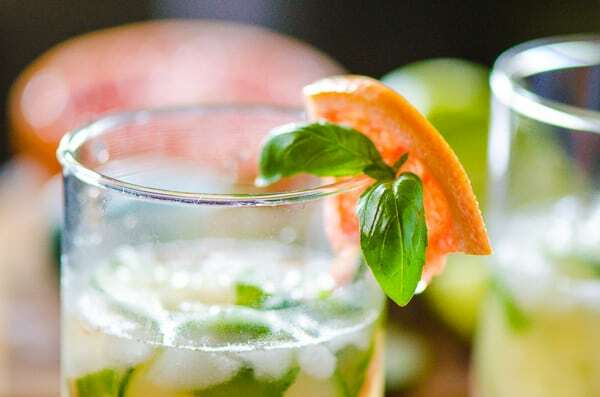 What a great Mojito recipe! Thanks Constance!! 🙂 I’m in love with cucumber in my drinks! Let me know how you like it, Kimberlie!! I’ll be sure to hop by and check out you recipe! Is this your first Sunday Supper? It is my first Sunday Supper. So far it seems great! This drink looks so refreshing and the photos are beautiful. Cucumber and grapefruit AND basil? IN a mojito? I need a pitcher because that sounds amazing.